Due to brisk sales and a supply shortage of a critical component, this product is temporarily unavailable. New backorders will be processed in the order received and are expected to ship the first week of May. FREE 18" x 24" EverMat™ Portable Standing Mat, 3/4" of 100% polyurethane comfort! 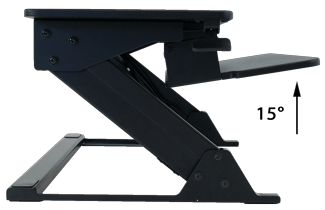 Where 95% of standing desk converters lack the ability to adjust the keyboard tray angle, the ZipLift+ gives you a tilt adjustment range of +10° to -15° — so you can stay ergonomically sound in the standing position. Even at full height extension (20 5/8"), the ZipLift+ offers the best lateral stability of any competing product in the market. Keep concentrating all day without any interruptions from a shaky work surface. Supports up to 35 lbs. Enjoy plenty of room for your monitor(s) with the ZipLift+'s expansive top work surface (35.4" x 15.7"). Large enough to fit 2 x 24” monitors, an Apple iMac, a monitor arm, or a laptop. Keep working the way you like even while you stand. The ZipLift+'s advanced Z-lift mechanism improves on competitors' designs by using silky-smooth gas struts in place of clangy springs and sawtooth increments. The result? Infinite stops. You can move your desk up to any level with the squeeze of the brake paddles, in complete silence. The center grommet hole on the ZipLift+ can accommodate most any monitor arm, to avoid neck craning. 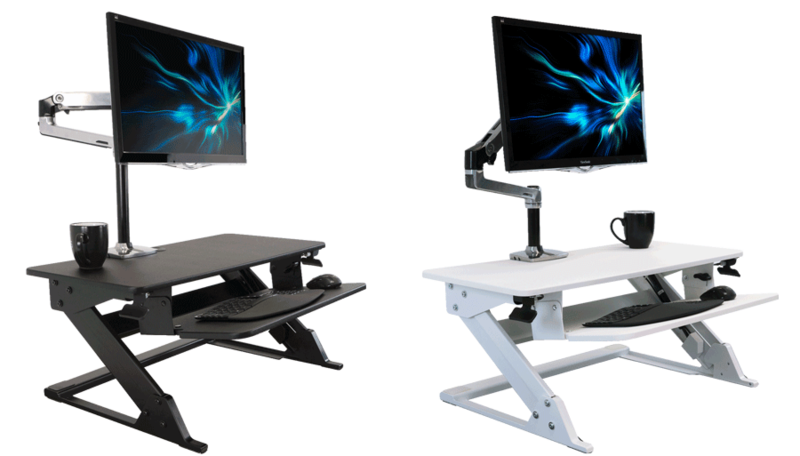 This feature, lacking on most desktop risers, is crucial for good ergonomics, as most people find they need their monitors significantly higher when standing than sitting. FREE EverMat™ Portable Standing Mat! Take care of your feet and get the most out of your new standing desk converter! A good anti-fatigue mat means more hours standing in full comfort, by reducing strain on your back, legs, and feet. Included with your ZipLift+ comes a free 18" x 24" EverMat™ Portable Standing Mat. It's 3/4" thick and 100% polyurethane for extra standing endurance! The ZipLift+ is a NEAT™ (Non Exercise Activity Thermogenesis) certified product; its usage will help combat the negative health effects of a sedentary lifestyle. Standing while working is the first line of defense against sitting disease, as the small movements you make throughout the day while standing increase your body’s energy expenditure and heart rate. The ZipLift+ is currently available in black or white surface colors. For the best ergonomics, you’ll always want to keep your monitor(s) at the proper height, distance, and angles. 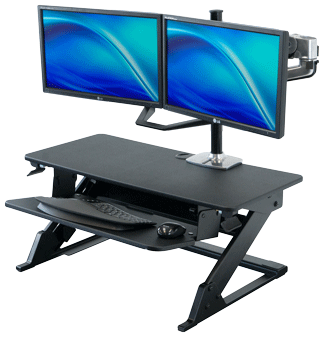 Monitor arms make moving your monitors easy, so you can find the right monitor position whether you're sitting, standing, or ‘perching’ at your desk. They help keep neck and eye strain at bay, and ensure you work in optimal comfort at all times. 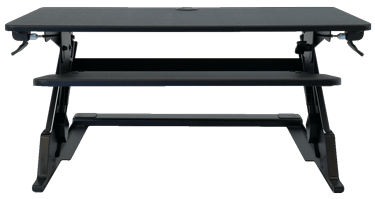 Curious which iMovR monitor arm is right for you? 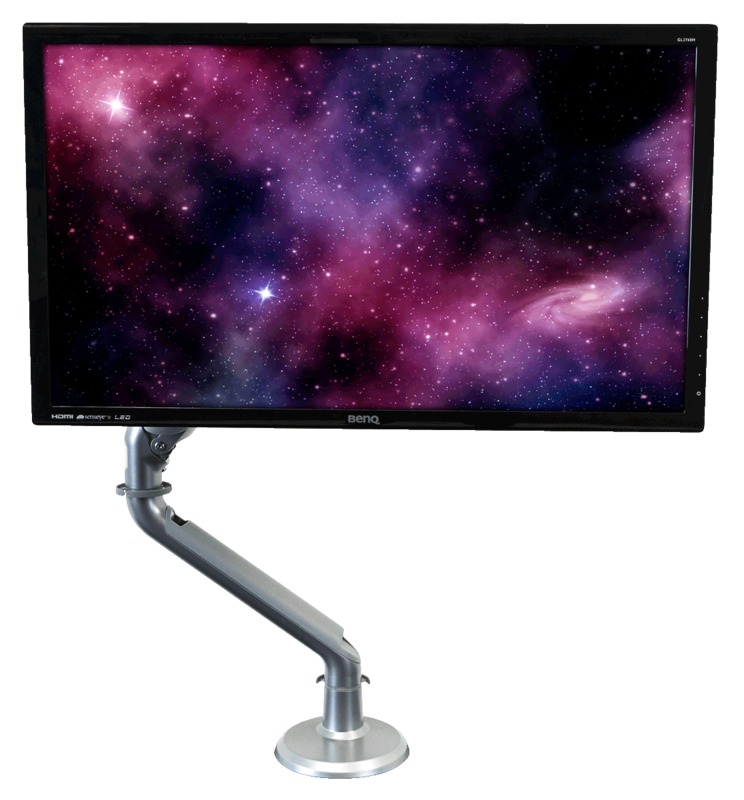 Visit our guide Selecting the Right Monitor Arm. 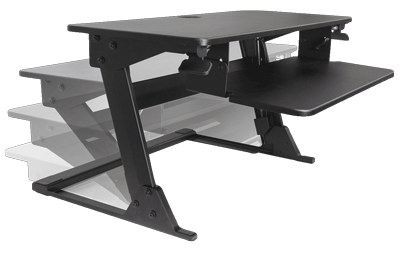 Do you have a competing standing desk converter like a Varidesk and want a better product? Send us a photo of your old model, and we'll send you a Ziplift or any other iMovR standing desk converter for $35 off! For more details, see our Conquest Rebate page. For user reviews and more, read ZipLift Reviews on WorkWhileWalking.com. 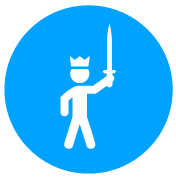 Read the Mac Sources review. 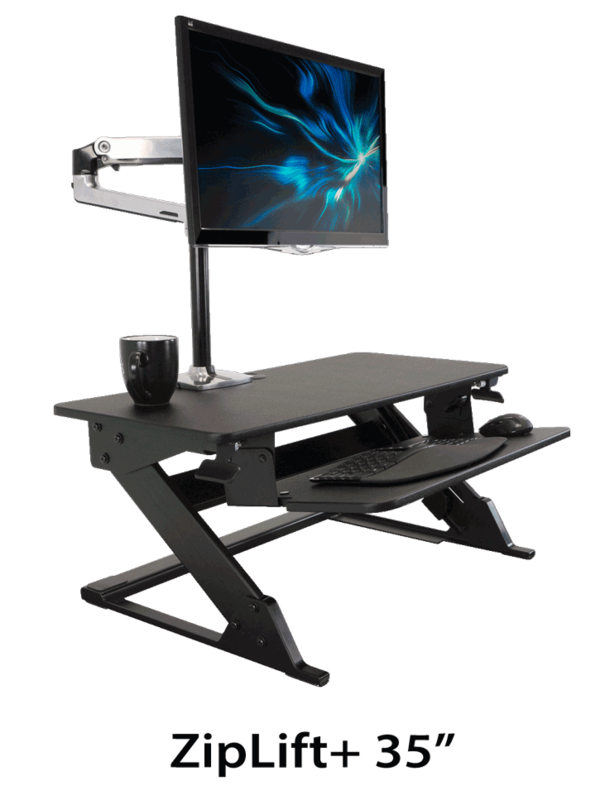 See more iMovR standing desk converters. Join Some of Our Customers Using the ZipLift! Work Surface Maximum Height: 20 5/8"
* The ZipLift+ can support a combined weight of 35 lbs between the top work surface and the keyboard tray. However, the counterbalance force is set to 15 lbs. 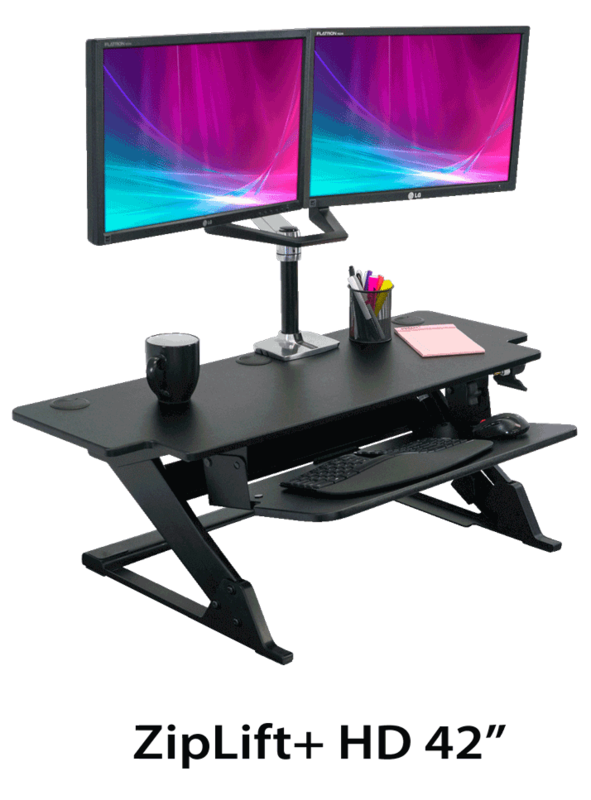 Please note that heavy dual monitors, or lightweight dual monitors attached to a dual monitor arm, would likely add more weight than the counterbalance force, and require additional lift effort from the user. 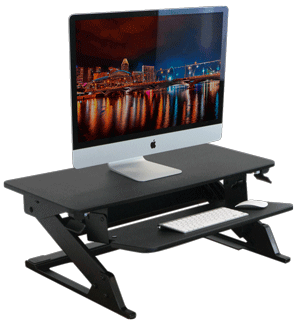 This is similar to all other z-lift type standing desk converters. 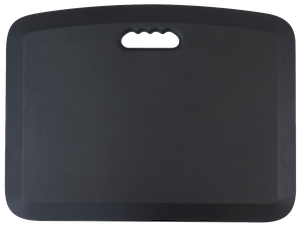 The iMovR ZipLift+ is supported by a 5-year warranty. See iMovR Terms and Conditions for more details. Other International: See our Shipping and Delivery Upgrade Options for complete details about our shipping service levels, methods of shipment, and options for other international locations.